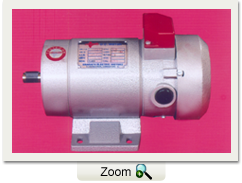 Our range of DC Motors with Gear are famed for their excellent quality and varied applications in several industries. They are already the most preferred choice of hundreds of satisfied clientele. We are reputed for our accuracy and precision, maintained during the entire process of manufacture. Right from the procurement of the raw material to the ultimate delivery of our products, every one of our Gear motors is put through a series of quality checks, to ensure flawless performance. Strict adherence to international standards of production ensures that our range of DC Gear motors are reliable, rugged and long lasting. They are also well known for their ease of operation and silent performance. We do extensive research on design specifications. This thorough analysis ensures that our Gear motors apart from being compact in design and function up to optimum levels under all conditions.